PHOENIX — The adult son of outgoing U.S. Sen. Jeff Flake will seek a new civil trial against a candidate seeking to replace Flake — Joe Arpaio — based on allegations that the then-sheriff brought a trumped-up criminal case against him in the deaths of 21 dogs at an Arizona kennel. Austin Flake and his ex-wife lost a malicious-prosecution lawsuit against Arpaio at a trial in December. But their attorney, Stephen Montoya, said he will seek another trial because authorities failed to turn over key evidence that he contends would have swayed the jury in his client’s favor. The lawsuit stems from animal cruelty charges that were filed against Flake and his then-wife, Logan Brown, in the dogs’ 2014 heat-exhaustion deaths at a suburban Phoenix kennel owned by Brown’s parents. The Flakes were caring for the dogs while the in-laws were out of town. The case against them was dismissed at the request of prosecutors after an expert determined an air conditioner at the kennel failed because the operators didn’t properly maintain it. The kennel owners eventually pleaded guilty to animal cruelty charges. 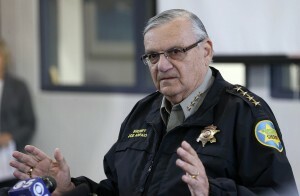 Arpaio was the sheriff of metro Phoenix at the time. The lawsuit alleged he pursued the case to garner publicity for himself and to embarrass Jeff Flake, who disagreed with Arpaio over immigration and was critical of the movement questioning the authenticity of then-President Barack Obama’s birth certificate. The senator isn’t seeking re-election. Arpaio announced his bid for Flake’s job in January. The Republican primary field also includes U.S. Rep. Martha McSally and former state Sen. Kelli Ward, an early favorite of former Trump adviser Steve Bannon. Last week, Austin Flake’s attorney said a graph created by authorities that accurately showed electrical usage dropping inside the kennel wasn’t turned over to his client before trial. Montoya said he learned of the chart’s existence while questioning a Maricopa County prosecutor during the trial. The graph undermines authorities’ claim that they believed electrical-usage records showed the kennel’s air conditioner was working all night, Montoya said. Jeffrey Leonard, an attorney representing Arpaio and Maricopa County, declined to comment on the dispute. In court records, Leonard said the claim that authorities violated pretrial evidence-exchange rules is incorrect. Arpaio declined to comment on the possibility of undergoing another civil trial in the dog deaths. In his testimony at the December trial, Arpaio was unable to cite any evidence to back up the criminal case against the couple, but expressed confidence in the work of his investigators. A second trial in the Flakes’ lawsuit against Detective Marie Trombi, who investigated the dog deaths, is scheduled for July 5. In a pretrial ruling, a judge had said Trombi wouldn’t face personal liability for her actions in investigating the animal deaths, but the judge reversed that ruling during the December trial. Steven Dichter, an attorney representing Trombi, declined to comment on why the ruling was reversed.